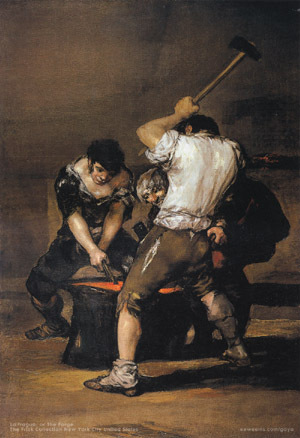 I look at a detail of Francisco Goya’s “The Forge,” and I imagine the effort it takes for three people to shape the metal into a useful item. One man holds the metal in place, while another runs the bellows. Still another strikes blows with the sledgehammer. Each careful step in the forge creates something more than strong metal; it creates a useful tool. Slowly but surely, every movement of the tongs, every blow of the bellows, and every strike of the hammer makes the metal what it is, at the end of a long process. Rather than for it to remain as a shapeless mass of chemicals and substances, the metal is shaped, formed, and built. The metal is, in effect, workshopped. Today, the Silliman workshop panel took one of my essays to task. Basically, as good as I think I am – or as good as others think I am – there’s still a lot of work to be done. I still make lapses in grammar, I still treat creative writing as a continuous stream of thought, and I still write with the kind of reckless abandon of a train that goes on and off the rails. I do write with the untamed anger of a caged animal; sometimes tame, sometimes unleashed, often unglued. My main weakness as a writer is recklessness. Recklessness manifested in lack: a lack of control, a lack of precision, a lack of training. Recklessness manifested in overkill: the urge to write fast, the urge to write a lot, the urge to write good. In effect, I think the humbling lesson I learned today is prudence. One, that I have the skill to write, otherwise I won’t be here anyway. Two, that I don’t have to try too hard at being a writer-type of person. Third, that as much as I can throw suggestions away, it’s much better to keep them and take them to heart. I can’t write at the standards and expectations of literary giants yet, but that doesn’t mean I can’t stand on their shoulders and try my best to be one of them eventually. It doesn’t mean that writers are only out to look after themselves, survey the competition, and stroke their own egos. Anyone who has written anything before knows that it’s extremely difficult to write. Whatever criticisms are there should be taken as a challenge; as a way to highlight my own weaknesses, improve my writing, and keep the little engine that could on the rails, and on the right track. Rails, like trains, are all made in a forge (in one way or another). A member of the panel gave me a valuable piece of advice today, aside from the technicalities of form. There are two kinds of anger and rage found in me that can be very useful. I have managed to harness the anger to write about the real world. With that, though, comes a different kind of anger that I should use as a motivation. That’s the anger and rage that comes from those who say that I cannot write. Mastery in writing, in my case, should begin with a mastery of emotions and a mastery in language. The fact that I am here in the company of writers is anything but a fluke. While there’s so much to learn, the only other reason why I’m here is that there are potentials in me that need to be mined, drawn out, shaped, and tempered. I’m not out to be a great writer. I’m not out for a Palanca, or to be the toast of the literary community. I’m an outsider, working my way to get inside. I have my insights, my view of the world, and my way with words, but those need to be tempered. I make my mistakes and learn from them, while exploring the possibilities available not just in writing, but life itself. A reckless train of thought, as well as reckless behavior, must be treated in the same way a piece of steel is treated in a forge: held down, blown away, hammered, beaten up, bent, and formed into something useful. I came to the realization that anyone practicing a craft – whether it’s painting or sculpting or writing – goes through the forge. While I didn’t get to learn much in the way of the kind of formal training I was expecting (this is, after all, a workshop and not a seminar), I did get to learn a lot about myself, and my place in the world. If I can temper myself enough, and if I am willing enough to go through all sorts of forges, I can be formed to form. this is kinda depressing for me. i write for a living and i’ve been doing it for 16 years now. but, up to now i feel as though i don’t deserve to be called a writer. i still struggle with words and issues of form among others. comparing your writing to my own, i can acknowledge that, you’re way better than me. finding out that you still have writing lapses only reminds me that i still have a long long way to go. ^^ I don’t really know. It’s more like the realization that I can only do this much, and that I’m just too reckless at this point. I think we all need to go through the forge, I guess.